While new copper gutters look good on just about any home they are super great for coastal areas. Because copper is corrosion resistant. Rather than rusting, copper develops a patina on its surface which protects the metal from the deterioration. So if you live near the ocean, and you want your gutters to last, then use new copper gutters. New copper gutters require the least amount of maintenance, especially if they are seamless like ours. We always shape them to flow water away from the house. And professionally install them with precision and care. We solder the copper instead of using sticky, unreliable caulking. Copper is completely recyclable, making it more sustainable and renewable than other gutter materials. But when you install great looking copper gutters, you probably won’t be recycling them anytime soon. Copper has great endurance too. Lasting more than 60 years with little maintenance (other than cleaning out leaves) copper gutters can go well over 100 years. Especially with proper initial installation, timely inspection and maintenance as needed. We see a lot of people spend extra money for all kinds of fancy roofs, windows skylights and then be shy about spending the extra money for a copper gutter system. Many of our competitors are reluctant to bring it to the customer’s attention that installing aluminum gutters (particularly in a salt air environment near the ocean) will not last as long as it would inland. If you live near the ocean, and you want your gutters to last, then use new copper gutters. 1. Copper rain gutters are extremely durable and long lasting. They survive weather extremes better than other gutter materials. Copper gutters can often last up to 100 years. Homeowners can recoup the higher initial investment of copper with fewer replacements needed over time. 2. Copper rain gutters offer instant interest and appeal. Through oxidation, copper gutters form a coat of patina over time. This can create a unique, stunning weathered look in just a couple years. Many homeowners enjoy the rustic charm of the patina. 3. This type of gutter material requires minimal maintenance. While you still need to clean them of leaves and debris, they rarely sag, dent or need replacement due to wear from the elements. 4. 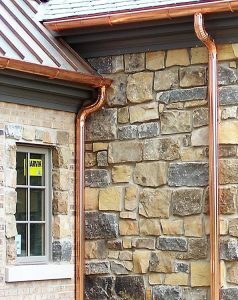 Copper rain gutters look great! They can easily complement an existing copper roof or other exterior fixtures. Going seamless creates a uniformity and beauty to the home’s look and appeal. 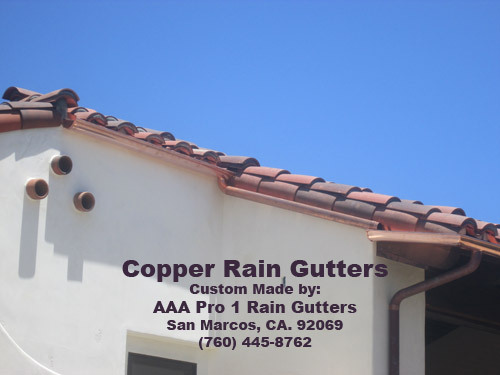 Copper rain gutters can be a great way to help a home stand out in the neighborhood. Adding a stately appeal, this material choice not only increases the value of the home but can also be a great selling feature when it comes time to put the property on the market. New copper gutters may be a bit pricey when comparing to aluminum. However the benefits and long term value of new copper gutters more than outweigh the initial upfront cost. Want a free onsite quote? You got it! Just ask. That way you’ll know the price involved upfront. No hidden costs here! We take pride in our company and in the work that we do. That pride results in a superior job well done for you. Whether we’re doing a simple gutter repair, or installing 50’ of gutter on your home or 25,000’ of commercial gutters in an apartment complex, we do the best job we can, every time. So if you are a homeowner or a property or HOA manager, and you care about the safety of your structures then call us. We can help you protect your investment in your home or your business. And do it quickly, cost effective and with a smile! Trust AAA Pro 1 Rain Gutters for superior service and installation of a wide range of quality commercial rain gutter products and services. Call or text us today at (760) 445-8762. We look forward to serving you!